The Model D Self Latching Lock (MDSL) has been designed specifically to suit fire doors fitted to the perimeter of buildings. Under Australian Standard AS 1905 Part 1 fire doors must be self-latching. Traditional fire door locksets use short tapered tongues, usually 12 mm long, to latch into the striker plate mounted on the door frame. This combined with the fact that egress fire doors open out means that they are susceptible to tampering and forced entry. The Rivers MDSL provides a solution to this security weakness. The Rivers MDSL Lock is a high security multiple point self-latching lock based on the heavily specified and commercially successful Rivers Model ‘D’ Lock series. The MDSL Lock utilises two 32 mm x 10 mm zinc plated steel locking bars that throw 45 mm to each locking point. This is a substantial security improvement on traditional fire door locksets. 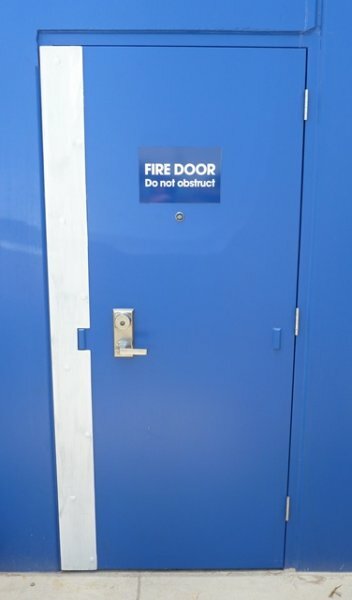 Fire doors use door closers to return the door leaf to the closed position after being opened. 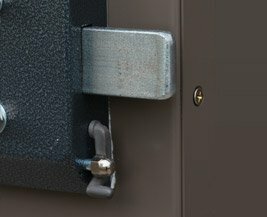 The Rivers MDSL lock has a release latch that triggers the locking bars that engage into latch slots prepared in the door frame. The Rivers MDSL Lock thereby creates a substantial security barrier. The Rivers MDSL Lock is adjustable to suit door widths from 760 mm up to 960 mm. For door widths under 760 mm or from 961 to 1190 mm our ‘long body’ must be specified. Other sizes can be made by special order. All Rivers MDSL Locks are fitted with an internal lever handle that rotates downward through ninety degrees to disengage the locking bars. As a result the MDSL Lock complies with the Building Code of Australia for use in emergency egress applications. The locks are supplied with a 201 cylinder and they can be master keyed by locksmiths. Rivers Model D Locks have been assessed to comply with Schools Facilities Standards – Section SS455 Door Hardware. Rivers Model D Locks achieved a Scale 7 rating under Australian Standard AS4145.2 testing. The Rivers MDSL Lock was tested by the CSIRO in a Pilot Fire Test reference FSP 0415. CSIRO Assessment Number FCO-1240 confirms that the Rivers MDSL Lock will not prejudice the fire resistance of Trafalgar fire rated doorsets for Fire Resistant Levels (FRL) up to -/240/30. BRANZ Assessment Report FAR 2684 and Fire Test Certificate No 426 confirm that the Rivers MDSL Lock will not prejudice the fire resistance of Pyropanel FR, Pyrolit and Pandor fire doorsets for RFL’s up to -/240/30. Australian Patent No. 2012258464 covers the design of the Rivers MDSL Lock. The Rivers MDSL Lock can be used in conjunction with Trafalgar, Pyropanel FR, Pyrolit and Pandor fire rated doorsets in all applications. 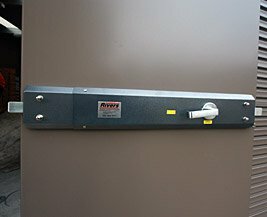 The Rivers MDSL Lock is designed for building perimeter doors of all solid door constructions including fire doors where a high security self-latching lockset is required. 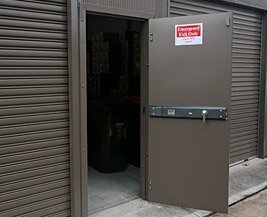 Applications include financial institutions, schools, government buildings, shopping centres, computer rooms, cash rooms, warehouses, record storage rooms, retail outlets, rear entry doors and fire exits. Hardware, where applicable, includes a brass chrome plated level handle, hardened steel nut plates, locking bar keepers, a 201 cylinder and hardened steel cylinder shield with anti-drill disk. Where external Key and Lever access is specified, hardware includes a stainless steel external body, brass chrome plated lever handle, 201 cylinder and anti-drill disk. The Rivers MDSL Lock is powder coated Dulux ‘Hammertone Black’. Special colours are available on request. The Rivers MDSL Lock is surface mounted to the inside face of doors of solid core construction. The lock is fixed using nut plates & threaded rod. For open out doors locking bars extend through slots cut into the door jamb. For open in doors nut plates & threaded rod are used to retain the locking bar keepers to the inside face of the door frame. Rivers can provide experienced installers to correctly fit the MDSL Lock ensuring security and reliable service. Locks can be fitted by trained locksmiths. Refer to fitting instructions provide with the lock.